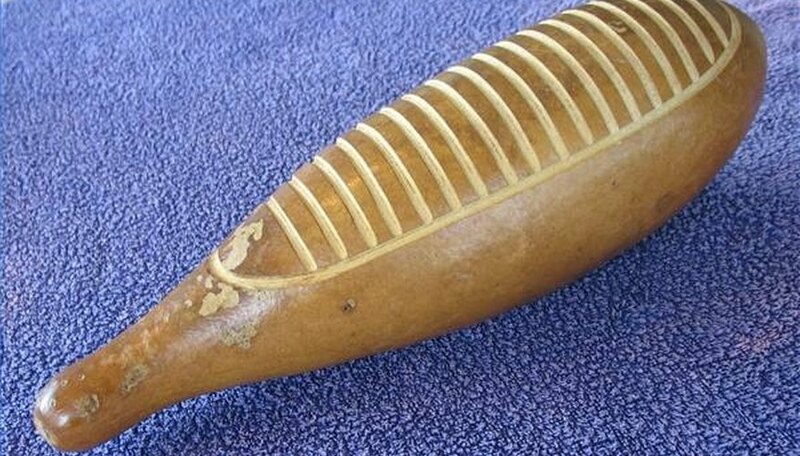 The guiro is a percussion instrument made from a hollowed-out gourd. It has two holes cut into one side and parallel grooves carved horizontally along the opposite side. It is played by rubbing a wooden stick or scraper along the grooves to create a rasping sound. The scraper is usually made from a small block of wood with metal prongs attached to it. It can also be made entirely of wood, metal, bamboo, shell, bone, ceramic or plastic. The size of the güiro can vary greatly but typically ranges from 12 to 16 inches long. Traditionally, this instrument is believed to have been conceived by the Taíno Indians though some contend it was created and brought to Puerto Rico and Cuba by the Arawaks. Variations of the guiro are played all over Latin America and are known by many different names, such as Guira, Ghicharo, Guayo, Rayo, Calabazo, Ralladera and Rascador. The güiro is frequently used in Latin American music and plays an essential role in many typical rhythm sections. Hold the guiro. There are two ways to hold the guiro if it has two holes. Put your index finger into the top hole and your middle finger in the other hole, or place your thumb in the top hole and lay the rest of the guiro in your palm. If the guiro has three holes, place your index finger in the center hole and let the rest of your fingers hug the instrument. Hold the scraper. The scraping stick is held in the opposite hand, wrapping your index finger around the stick as you would when holding a drumstick. If you are using a scraper, hold it partly in the palm of your hands. Wrap your fingers around the edge of the wood portion and leave the wires of the scraper uncovered. Drag the scraper or stick across the grooves to get music from the guiro. To play a medium tempo, such as the cha cha, play by using a down up, down up pattern of quarter notes. For a faster tempo, such as a salsa, use a down down up pattern. The guiro can accompany many rhythms and there are many ways to play it. The more familiar you become with the sounds it produces, the better you will be able to play the different rhythms. Bear in mind, playing the g&#xFC;iro usually requires both long and short sounds that are made by using long or short strokes.